In December 2013, as part of a product placement marketing campaign with the film Anchorman 2: The Legend Continues, Miller reintroduced the original Miller Lite packaging on its 16-US-fluid-ounce (470 ml) cans for a limited time. However, the original packaging unexpectedly went over so well for Miller that by September 2014, it decided to switch back to the original packaging full-time, including on bottles and tap handles, mirroring the unexpected success that PepsiCo had in 2009 with its Pepsi Throwback & Mountain Dew Throwback lines in tapping into the retro-themed packaging market. Life wasn’t the same before we invented light beer. Nights were shorter. Grills were emptier. Then came Miller Lite, and everything changed. 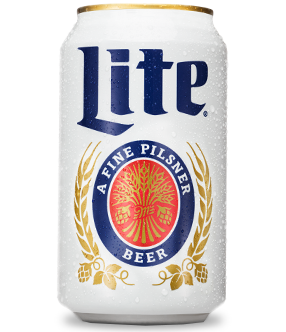 To celebrate, we’re putting Miller Lite back in its original look. So raise a can, bottle, or pint and enjoy.